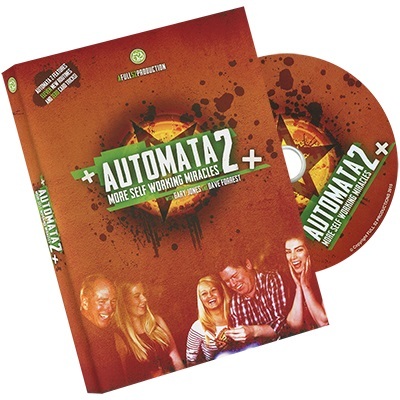 'Automata 2' marks the second instalment of the smash hit self-working series from Full 52 Productions. On this DVD you'll find 11 more completely self working magic effects using a variety of everyday objects and this time around - there are Zero Card Tricks! In 'Aqua Ring' Gary borrows a finger ring and ties it securely to a loop of dental floss yet the ring somehow makes good it's escape... underwater! In 'P.O.A' a coin cleanly vanishes from Dave's hand only to re-appear taped to a business card that was previously examined and signed by a spectator! Watch Gary correctly identify which drawing was made by which spectator before accurately duplicating a third drawing in 'Peeky Blinder!' Dave reaches into his spectator's mind and begins to hum the tune that his spectator is mentally singing to themselves in 'Earworm!' And, in 'lead Free', a coin cleanly and effortlessly bends in the hand of your spectator! All this plus Six more spectacular effects including a self working 'coin through table' (Chip Shot), a self working book test (Fixed Quote) - the list goes on! 'Automata 2' - A killer collection of original magic and mentalism with rings, strings, coins, books, business cards, poker chips, dice, mobile phones, wallets, envelopes... but definitely no playing cards! Amazing Business - Triple prediction with business cards! Earworm - Reveal a song they're thinking of! Weird Wallet - Three chances to win... they never do! My Hero - Which comic book superhero are you? Peeky Blinder - A three part mentalism spectacular! Fixed Quote - Did somebody say self working book test? Chip Shot - Poker chip through table! P.O.A - Self working coin vanish...and reappearance! No Luck - Predict the outcome of three dice... almost! Aqua Ring - Houdini's water torture escape, close-up! Lead Free - Self working coin bend, anyone?? ?